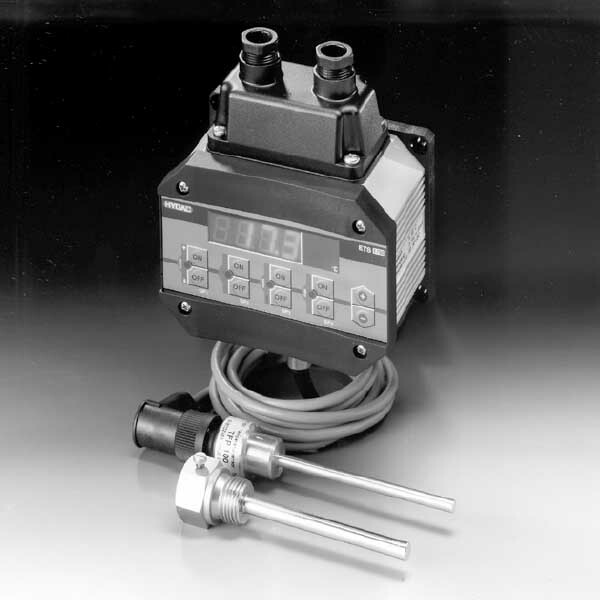 The electronic temperature switch ETS 1700, often together with the temperature probe TFP 100, serve for tank mounting. First of all, the 4-digit display can indicate the actual temperature, one of the switching points or the maximum temperature value. What’s more, the maximum temperature indicates the record of the highest temperature, since switching on the unit or since the last reset. The 4 switching outputs can control heating and cooling processes in hydraulic systems, for example. Furthermore, the adjustment of four switching and switch-back points (which are independent of each other), is possible and very simply via the keypad. An analogue output (4 .. 20 mA or 0 .. 10 V) is also available for integration into monitoring systems (e.g. with PLC).